Apple has signed a deal with Volkswagen to use Volkswagen vans as self-driving shuttles designed to transport employees around its various campuses and office buildings in the San Francisco Bay Area, reports The New York Times. Apple has been working on developing the shuttle program, called "PAIL" or Palo Alto to Infinite Loop, since last summer. At the time news of Apple's work on the program first surfaced, the company was said to be planning to install its own self-driving software in a commercial vehicle from an automaker, which has turned out to be Volkswagen. Under the terms of the deal, T6 Transporter vans from Volkswagen will be turned into self-driving shuttles for employees. Apple's self-driving shuttle program is said to be behind schedule and "consuming nearly all of the Apple car team's attention," hinting at ongoing problems on its car-related project, which has already been scaled back. Apple originally had grander plans for autonomous vehicles and over the course of the past several years, attempted to ink deals with companies like BMW and Mercedes-Benz, which would have led to the development of an all-electric autonomous vehicle. According to today's report, no deal was able to be established because Apple was asking potential partner companies to "hand over control" of data and design, something no car manufacturer was prepared to do. When its grandiose self-driving vehicle plans fell through, Apple shifted focus to autonomous driving software under the leadership of Bob Mansfield. Apple is now working on its shuttle program and has been testing several Lexus SUVs equipped with self-driving hardware and software out on the streets of Cupertino and surrounding areas. Beyond the shuttle plan, Apple is said to have no clear idea of what it's going to do with its autonomous driving project. They can’t even make my iPhone bug free. As if I’m ever going to trust their driverless car software. (That goes for all tech companies and all driverless cars as well). Ive been a VW driver since 1998. They took some well deserved heat from the diesel scandal as they should. But for the money I won't drive anything else. And their cars get better and better. I still don't see self driving cars as the future. Hopefully it won’t use Apple maps because a driverless car following Apple maps would get people killed. Not the only company this can be said about, but Apple has lost its focus. This self-driving car baloney is evidence of that. Let the automobile manufacturers worry about vehicles, and let the computer companies focus on computers. Apple is stretching itself way too thin, with hands in multiple cookie jars: automobiles, media production, smart devices... oh, and maybe a couple of computers, if they have the time. It's greed and hubris, plain and simple; Apple's eyes are too big for its stomach. Not to mention, no one has made a valid argument for what's so great about self-driving cars anyhow. For all the complaining people do about the dangers of humans behind the wheel, I don't see how computers are an improvement. The human brain is still light-years ahead of the most advanced electronic circuits in its ability to comprehend, adjust and integrate the multitude of information received when driving a vehicle (or performing any other complex task). For all its potential shortcomings, I'd trust my life to human judgement than a machine algorithm any day. It could allow people who are unable to drive, for whatever reason, a way to stay in their homes instead of having to sell. Think of someone who has to move into an assisted living facility because they can't get to a doctors office. This usually destroys whatever savings that person had for retirement. That sounds great, but if someone unable to drive (i.e., handicapped or elderly) cannot afford to hire someone to drive them, how would they afford an entire driverless car (or, for the sake of argument, even a modification to their current car)? We'd like to suppose that a family member or friend would be around to help, but it seems we're all functioning on the assumption that Grandma's been deserted by her children. See, the problem starts to become about deeper social issues than any particular technology can solve. The engineer who designs such products with the hope of solving these issues has a terribly simplified view of the world in his head. I agree there has to be a ton of work to be done in this regards, but, I would be more comfortable in that than all idiot human drivers. So we can't trust humans to drive, but we can trust humans to design algorithms by which computers drive? o_O By your logic, I am better off trusting my life to a few hundred engineers whom I've never met (and who will most likely never face direct responsibility for potential failures of their design) than I am trusting the men and women driving next to me, who have as equal and vested an interest in our mutual safety as I do. Look, I understand the ideals, and the purported benefits to society are noble goals. Unfortunately, new technology always creates as many problems as it attempts to solve, if not more. Moreover, whether our goals are good or bad, the unerring faith which many of us increasingly put on the shoulders of science and engineering is, in my opinion, very much misplaced. Apple has signed a deal with Volkswagen to use Volkswagen vans as self-driving shuttles designed to transport employees around its various campuses and office buildings in the San Francisco Bay Area, reports The New York Times ('https://www.nytimes.com/2018/05/23/technology/apple-bmw-mercedes-volkswagen-driverless-cars.html'). Apple has been working on developing the shuttle program ('https://www.macrumors.com/2017/08/22/apple-self-driving-campus-shuttle/'), called "PAIL" or Palo Alto to Infinite Loop, since last summer. At the time news of Apple's work on the program first surfaced, the company was said to be planning to install its own self-driving software in a commercial vehicle from an automaker, which has turned out to be Volkswagen. Apple originally had grander plans for autonomous vehicles and over the course of the past several years, attempted to ink deals ('https://www.macrumors.com/2015/07/31/apple-bmw-car-talks-could-resume/') with companies like BMW and Mercedes-Benz, which would have led to the development of an all-electric autonomous vehicle. When its grandiose self-driving vehicle plans ('https://www.macrumors.com/2015/02/13/apple-working-on-electric-car/') fell through, Apple shifted focus to autonomous driving software under the leadership of Bob Mansfield ('https://www.macrumors.com/2016/07/25/apple-car-bob-mansfield/'). 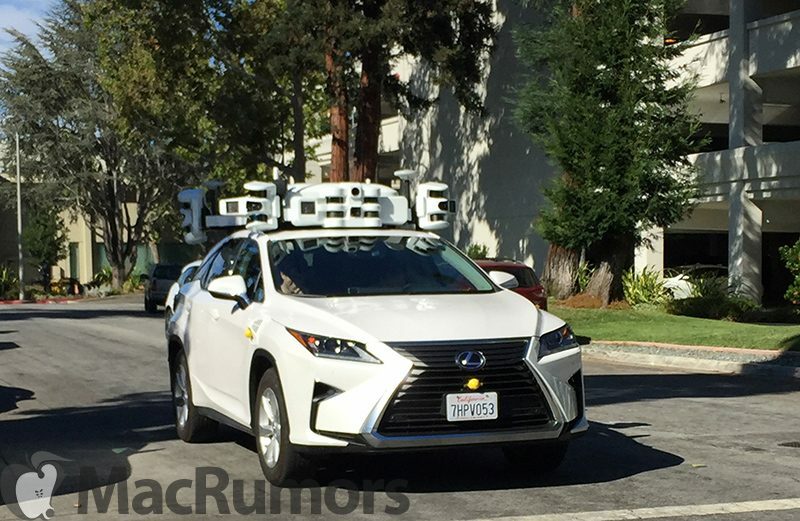 Apple is now working on its shuttle program and has been testing several Lexus SUVs ('https://www.macrumors.com/2018/05/14/apple-expands-self-driving-car-fleet/') equipped with self-driving hardware and software out on the streets of Cupertino and surrounding areas. Beyond the shuttle plan, Apple is said to have no clear idea of what it's going to do with its autonomous driving project. This is so stupid. Self driving cars are some 50 years away. Firstly the software is not ready at all. I saw how the Uber car just rammed the woman just walking her bicycle across the intersection. Even a 6 year old would have press the brake pedal. The software was so busy trying to decide God know why and killed someone. No matter what, the first time an Apple car kills a child, that will be the end of the program. For sure. The jury will decide for billions. More vertical integration is great! What's next? Apple's own chicken farms to supply their cafeterias? This project is going nowhere and will quietly be killed off.